Door installers are reliant on their door supplier; an unreliable supplier who provides inferior products will, inevitably, affect jobs in a negative way. Therefore, it’s in an installer’s best interest to switch suppliers if a better one becomes available. So, you can be certain that you end up with the best possible supplier, we’ve listed the key reasons to switch. Secured by Design (SBD) is a scheme run by the UK Police and it recognises excellent security levels amongst doors and other products. This is important because security is paramount with a door, especially when you consider that 74% of thieves use the front door to enter the home. Therefore, by stocking SBD accredited products, you can offer your customers total peace of mind. Both our XtremeDoors and LINKS composite doors are available with it. An increasing number of homeowners are looking to make their home more efficient and reduce their carbon footprint. Therefore, a door which excels in terms of thermal efficiency can give you the edge over competing installers. If choosing Vista Panels as your door supplier, however, you will always have that edge; our XtremeDoors feature an ultra-dense foam core encased by uPVC edge-banding, so U-values of just 0.8 W/m²k are achieved. Choice is another very important consideration when looking for a new door supplier. This is because customer tastes differ wildly, so the more choice there is, the more customer demands you’re able to meet. 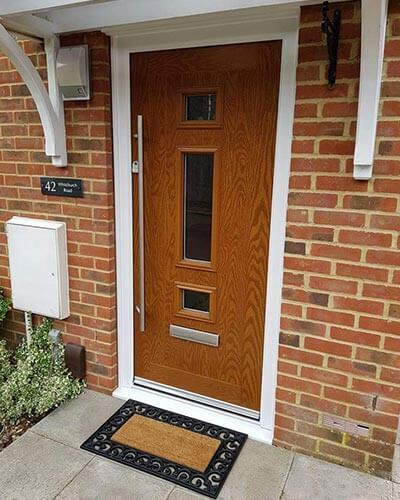 With Vista as your door supplier, you have access to contemporary and traditional door designs in a wide choice of colours, smooth and woodgrain finishes. We also offer a wide number of glass designs & glass types, along with an impressive selection of door furniture. By sourcing the best products on the market, you’re able to offer your customers higher quality goods. Therefore, leading to happier customers. Fortunately, all our uPVC panels and composite doors are manufactured to the highest standards to maximise durability and performance. Both can be easily maintained and they are also CE marked. The quicker products are available to you, the sooner you can get started on the job. Not only does this mean that you won’t leave your customers waiting around, but it means you can get started on the next job quicker, improving your potential to earn money. To ensure our partnered installers can get to work promptly, Vista supplies uPVC panels and composite doors anywhere in the UK within five working days. Composites requiring a top/sidelight or a Heritage spray colour, however, will be delivered to you within ten. If you have the option to save yourself some money without sacrificing product quality, some might say that choosing not to do so would be a questionable decision. So, if this option becomes available to you, it’d be a wise move to take advantage of it. Here at Vista, all of our customers have access to competitive trade prices yet we never sacrifice on the quality of our products. If you’d like to change your door supplier to one of the UK’s leading providers of uPVC panels and composite doors, call Vista Panels on 0151 608 1423 or contact us online today. This entry was posted in Composite Doors, PVCu Doors.